The Whistler Group of Bentonville, Ark., is recalling about 10,400 portable jumpstart power supplies. The jumpstart’s lithium battery can overheat and cause the units to melt, catch fire and ignite nearby items, posing a fire hazard to consumers. The company has received 45 reports of jumpstart and power supply units overheating and melting, including 18 reports of fire, resulting in approximately $16,000 in property damage. No injuries have been reported. 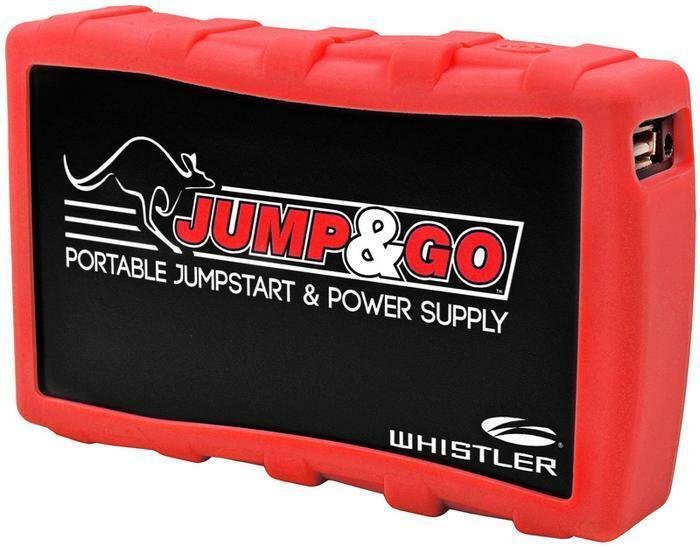 This recall involves Jump&Go Portable Jumpstart & Power Supply 12V power supplies, with model numbers starting with WJS-3000. The pocket-sized jumpstart power supplies measure about 5.1 inches tall x 3 inches wide x 0.9 inches deep; and were sold in red, black, yellow and pink. They have detachable jumper cables; built-in high output LED flashlight with emergency flashing patterns; and a USB port to charge phones, tablets and cameras among other electronic devices. The Jump&Go and Whistler logos are printed on the front of the unit. Recalled units have date codes in YYYY/WW format from 201404 through 201439. The model number and date code are on the back of the unit under the colored silicone boot. The date code is stamped directly on the case adjacent to the operational label. The model number is on the operational label. Units that have a serial number on the operation label are not included in this recall. The power supplies, manufactured in China, were sold at Hammacher Schlemmer, Radio Shack, Walmart and other retail stores nationwide and online at Amazon.com, Sears.com and Staples.com from May 2014, to October 2014, for between $60 and $120. Consumers should immediately stop using the recalled unit and contact Whistler for a free replacement, including shipping to return the recalled unit. Consumers may contact Whistler toll-free at (855) 667-9081 from 9 a.m. to 5 p.m. CT Monday through Friday. Sweet Sam's Baking Company of Bronx, N.Y., is recalling all lots of Starbucks Black & White Mini Cookies sold in Starbucks Company operated stores on or before Thursday, April 23rd, 2015. The product contains milk, an allergen not listed on the label. Two customers with milk allergies reported having an allergic reaction after consuming the product. No other illnesses have been reported to date. The Black & White Mini Cookies were sold in Starbucks Company -operated stores in Florida, New York, New Jersey, Pennsylvania, Washington D.C., Maryland, Virginia, Connecticut, Delaware, Georgia, Ohio, South Carolina and West Virginia. The product comes in a 2.0-oz. 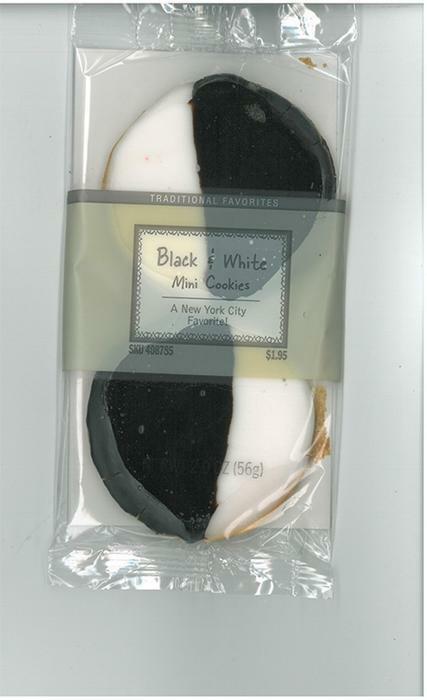 (56-g) clear film package, each containing two cookies, with the words “Black & White Mini Cookies”, “A New York City Favorite”, and “SKU 408785” printed on the front of the package. The words, “Manufactured for: Starbucks Coffee Company”, and UPC code “833282000495,” among other details, are printed on the rear panel. Customers who purchased the recalled product and have an allergy to milk should discard it or return it to any Starbucks store for a full refund. Consumers with questions may contact Starbucks customer relations at 1-800-782-7282, Monday through Friday, 8:00 AM to 5:00 PM, Pacific Time. SM Fish of Far Rockaway, N.Y., is recalling 8-oz. containers of Ossie’s Pickled Lox & Cream. The recalled product, packed in clear, plastic containers bearing UPC code 739885104113 and date code “06/04/15” (representing expiration date) located on the bottom of the plastic tub, was sold in retail stores in New York and New Jersey. Customers who purchased the recalled item should return it to the place of purchase for a full refund. Consumers with questions may contact the company at 718-945-9800, Monday – Friday, 9 am – 4 pm, ET. 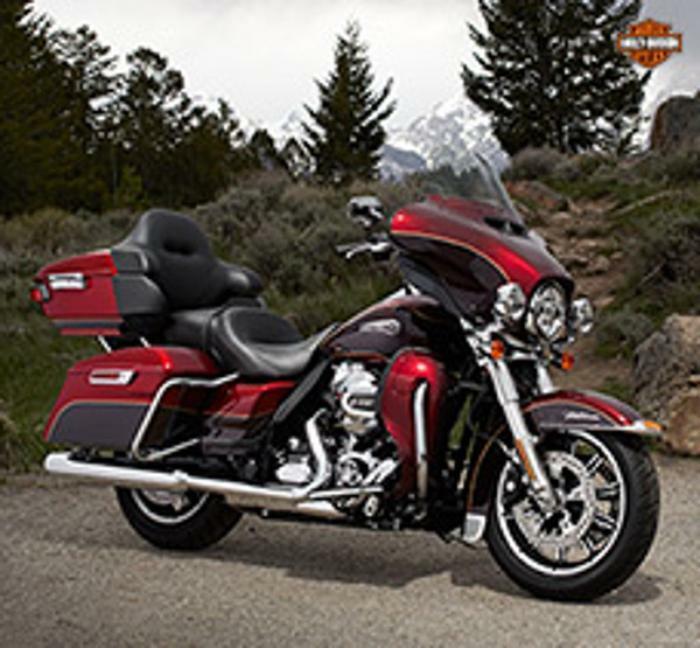 Harley-Davidson Motor Company is recalling 8,904 model year 2015 XG500 motorcycles manufactured January 28, 2014, to March 9, 2015, and 2015 XG750 motorcycles manufactured May 12, 2014, to March 9, 2015. The recalled motorcycles may have been manufactured without a rear reflector assembly which can reduce the vehicle's visibility to other drivers, increasing the risk of a crash. Harley-Davidson will notify owners, and dealers will install a rear reflector assembly, free of charge. The recall is expected to begin in April 2015. Owners may contact Harley-Davidson customer service at 1-800-258-2464. Harley-Davidson's number for this recall is 0620. 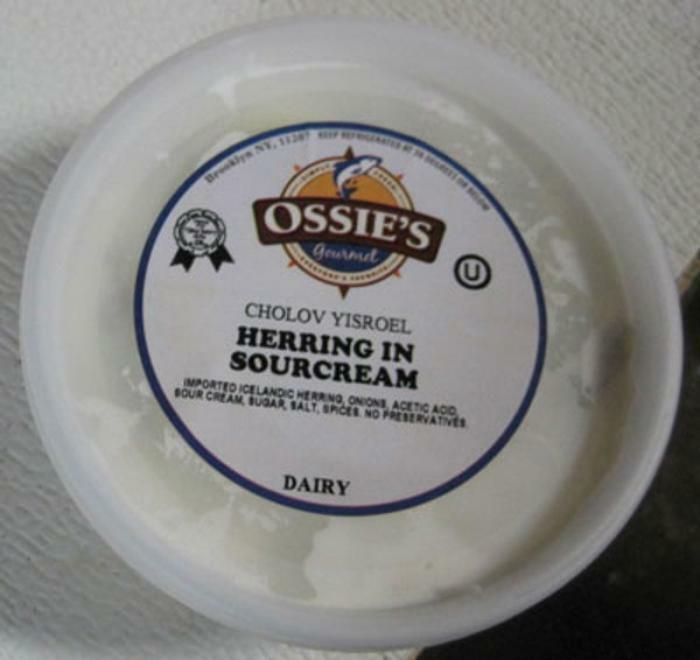 SM Fish of Far Rockaway, N.Y., is recalling 8-oz containers of Ossie’s Herring In Sourcream and Ossie’s Pickled Lox Dairy. The products contain milk, an allergen not listed on the label. The products were sold in retail stores in New York and New Jersey. Ossie’s Herring In Sourcream is packed in 8-oz. clear, plastic containers bearing UPC code 739885114174 with date code “06/08/15” (represents expiration date) located on the bottom of the tub. 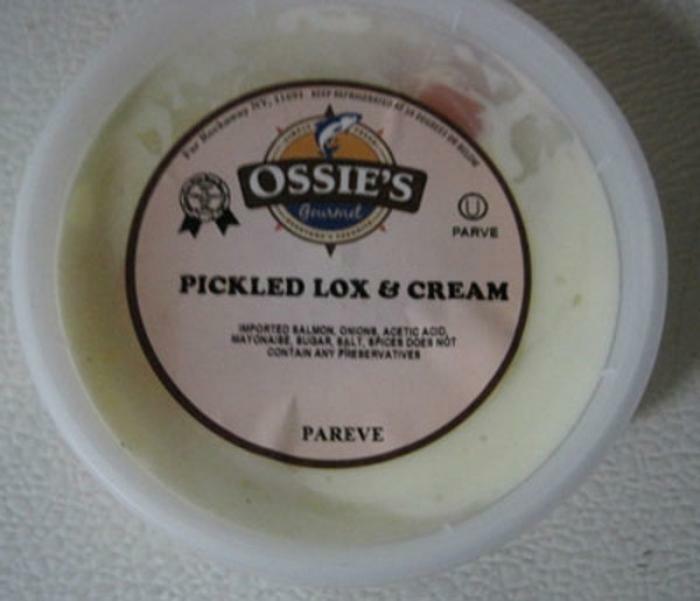 Ossie’s Pickled Lox Dairy is packed in 8-oz. clear, plastic containers bearing UPC code 739885114136 and date code “06/08/15” (represents expiration date) located on the bottom of the tub. Customers who purchased these items should return them to the place of purchase for a full refund. Roberta Roller Rabbit of New York, N.Y., is recalling about 32,000 children’s pajama sets. The garments fail to meet federal flammability standards for children’s sleepwear, posing a risk of burn injury to children. This recall involves children’s pajamas from Roberta Roller Rabbit by Roberta Freyman. The pajamas are 100% cotton, two-piece pajama sets sold in toddler size 1 through youth 12. The sets were sold in two styles: long-sleeve with pants or short-sleeve with shorts. Both styles were sold in eighteen prints in various colors Babar, Bump, Christopher, Colada, Dino, Elephant, Goby, Hathi, Heart, Heebo, Moby, Monkey, Owl, Rain, Rico, Scotty, Teddy, and Ticochon. Roberta Roller Rabbit is identified on a yellow label sewn into the neck and waist of both the top and bottom. 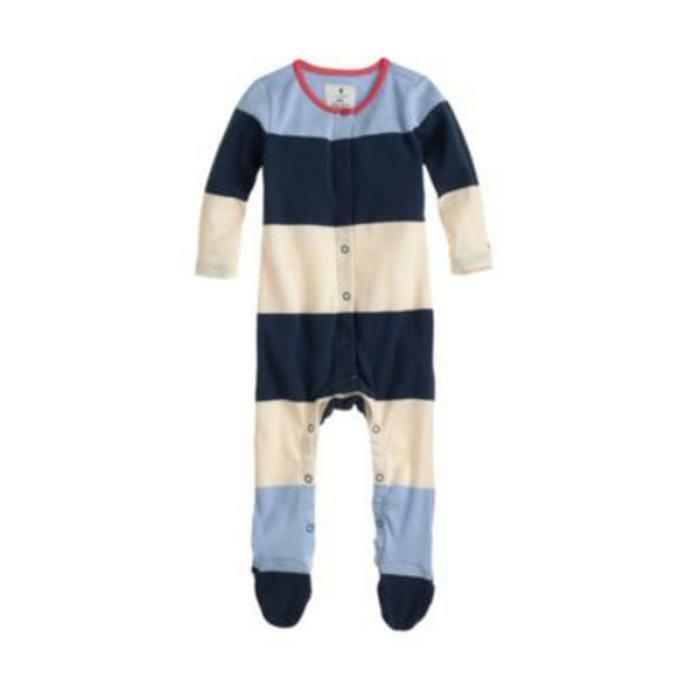 This recall includes all children’s sleepwear garments with a sewn-in label at the neck. The pajama sets, manufactured in Peru, were sold at Roberta Roller Rabbit retail stores, online at www.robertarollerrabbit.com and through other retail and wholesale outlets from January 2012, through February 2015, for between $55 and $65. Consumers may contact Roberta Roller Rabbit toll-free at (866) 227-6938 from 9 a.m. to 5 p.m. ET Monday through Friday. The clutch master cylinder may lose the ability to generate enough lift to disengage the clutch, especially if the motorcycle has been parked for an extended period of time. Harley-Davidson will notify owners, and dealers will flush the clutch system and rebuild the clutch master cylinder, free of charge. The recall is expected to begin April 23, 2015. Owners may contact Harley-Davidson customer service at 1-800-258-2464. Harley-Davidson's number for this recall is 0165. Euro-Pro Operating of Newton, Mass., is recalling about 142,650 Shark brand Rotator Powered Lift-Away series upright vacuum cleaners. The aluminum wand can disconnect from the vacuum cleaner’s handle and remain energized with electricity, posing a risk of electric shock. The firm has received 62 reports of incidents in which the aluminum wand disconnected from the vacuum cleaner’s handle. No injuries have been reported. This recall involves 4 models of Shark brand Rotator Powered Lift-Away series upright vacuum cleaners. They are either maroon or purple and have a clear plastic middle section. Shark and Rotator are printed on the front of the vacuum cleaners. They measure about 45 inches tall by 12 inches wide. Recalled model numbers include NV650W, NV651, NV652 and NV660. The model number is printed on a silver sticker on the upper right-hand corner of the back of the unit. Models NV650W and NV652 are maroon. Model NV650W is sold directly to consumers by Euro-Pro and model NV652 is sold at retail stores. Models NV651 and NV660 are purple and are sold at retail stores. The date code is printed on the metal prong of the power plug and shows the week and year of manufacture in the WWYY format. Recalled units have date codes beginning with the number 48 or lower and ending with 14. Vacuum cleaners marked with a dimple or green circle sticker on the outside of the plastic cuff that holds the aluminum wand have been inspected by the firm and are not included in this recall. 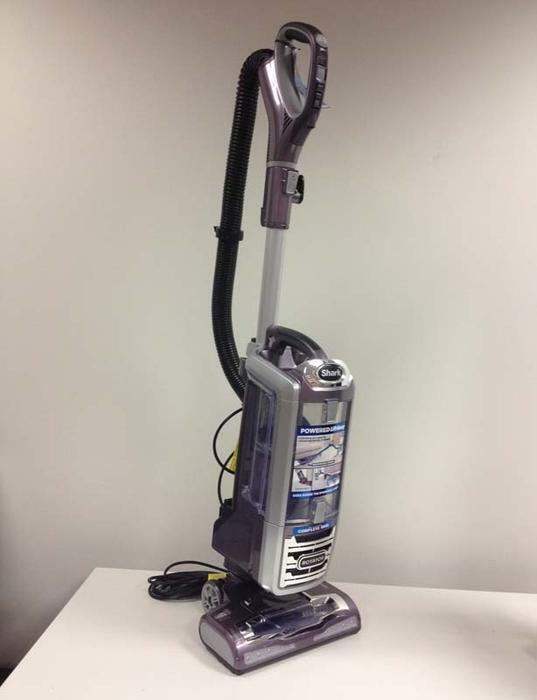 The vacuum cleaners, manufactured in China, were sold at Bed Bath & Beyond, Best Buy, Kohl’s, Lowes, Target and other stores nationwide, online at www.sharkclean.com and through TV infomercials from August 2014, through March, 2015 for between $250 and $350. Consumers may contact Euro-Pro toll-free at (877) 593-5140 from 7 a.m. to 11 p.m. ET Monday through Saturday, and from 9 a.m. to 8 p.m. ET on Sunday. J. Crew Group of New York, N.Y., is expanding its recall of baby overalls by about 20,000. In May 2014, 8,700 baby coveralls were recalled. Snaps on the coveralls can detach, posing a choking hazard to young children. The firm has received 10 reports of snaps detaching. No injuries have been reported. The coveralls, manufactured in China, were sold exclusively at J. Crew stores in California, Florida, Georgia, Illinois, Massachusetts, New Jersey, New York, Texas and Washington, D.C., online at jcrew.com and the J.Crew catalog from April 2014, to March 2015, for between $30 and $33. Consumers should immediately stop using the coveralls and contact J. Crew for a full refund. Consumers who purchased the garments online will receive instructions for returning the coveralls, including a postage-paid shipping label. J.Crew is contacting consumers who bought the coveralls directly. Consumers may contact J. Crew at (800) 261-7422 anytime daily or by email at 24-7@jcrew.com. AG Professional Hair Care Products of Burnaby, British Columbia, Canada, is recalling about 3,100 Sweet Heat hair dryers. The hair dryers do not have an immersion protection device, which guards against electrocution or shock if the dryer is immersed in water. 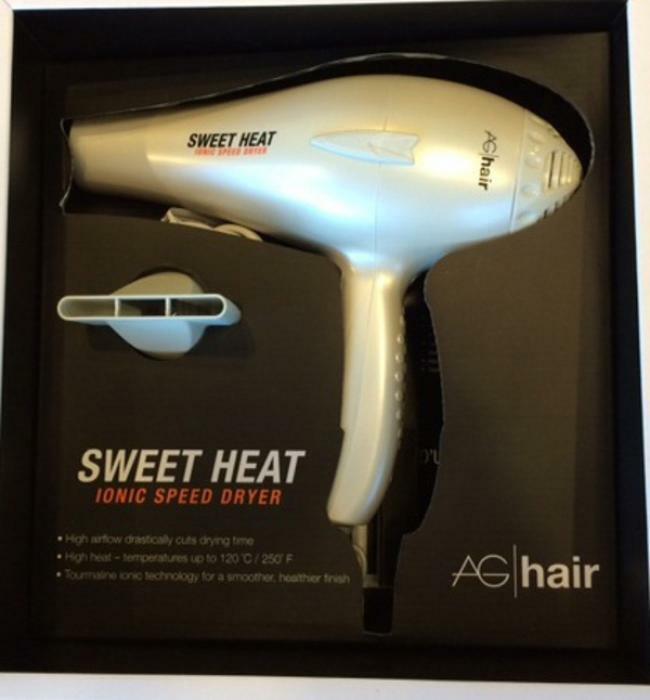 This recall involves Sweet Heat handheld hair dryers. The hair dryers are white and have the words “Sweet Heat” printed in black near the blower nozzle. “AG Hair” is printed in grey and black on the back of the blower nozzle, above the handle. The hair dryers, manufactured in China, were sold at ULTA Beauty and other beauty supply stores and hair salons nationwide from May 2013, through March 2015, for about $100. Consumers may contact AG Hair toll-free at (866) 924-4247 from 11:30 a.m. to 7 p.m. ET, Monday through Friday, or by email at recall@aghair.com. 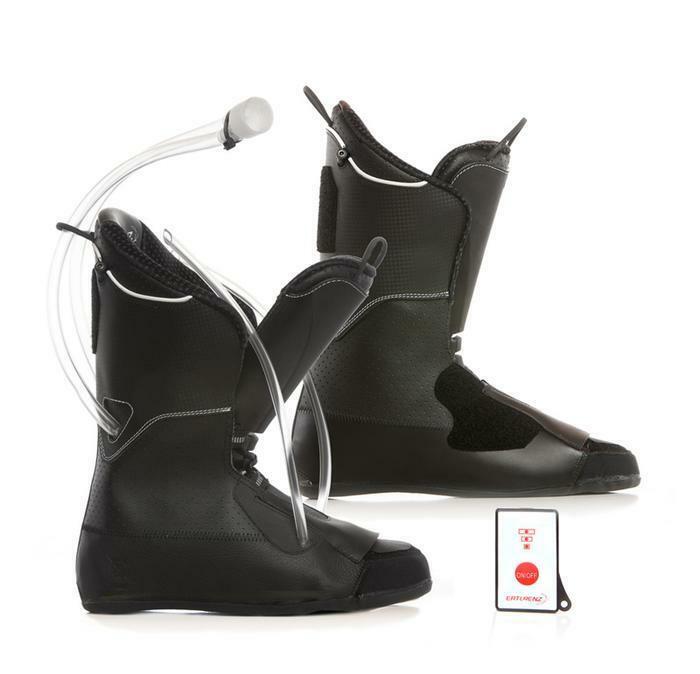 Gorsuch Ltd. of Avon, Colo., is recalling about 300 Ertlrenz Trim Heat and Foam Heat ski boot liners. The liner can overheat when charging, posing a fire hazard. The company has received 3 reports of the heat liners smoldering during the charging process. No injuries have been reported. The liners, manufactured in Germany and Austria, were sold at Gorsuch Ltd. stores in Aspen, Vail and Beaver Creek, Colo., from November 2011, through March 2015, for about $690. Consumers may contact Gorsuch toll free at (844) 451-8650 between 9 a.m. and 5 p.m. ET Monday – Friday. 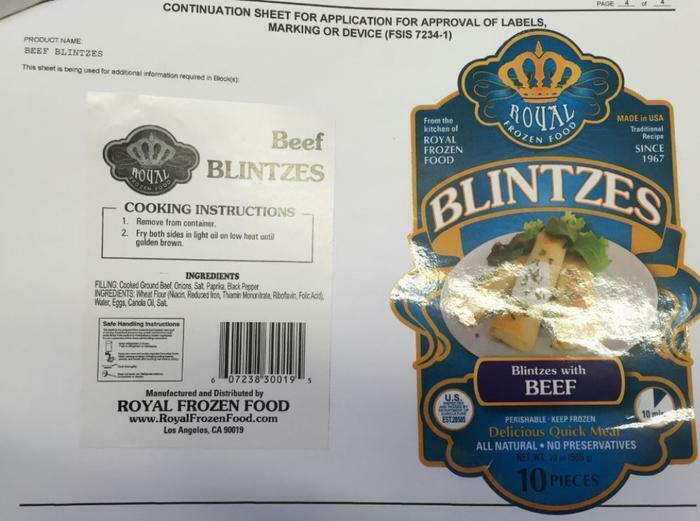 Royal Frozen Food of Los Angeles, Calif., is recalling approximately 3,821 pounds of beef and chicken products. The products contain milk, an allergen not declared on the product label. no reports of adverse reactions due to consumption of these products. The recalled products bear the establishment number “Est. 20585 or P-20585” inside the USDA mark of inspection, and were sold in retail stores and markets in California and Nevada. Consumers with questions about the recall may contact Gloria Cheng at (323) 938-8666. 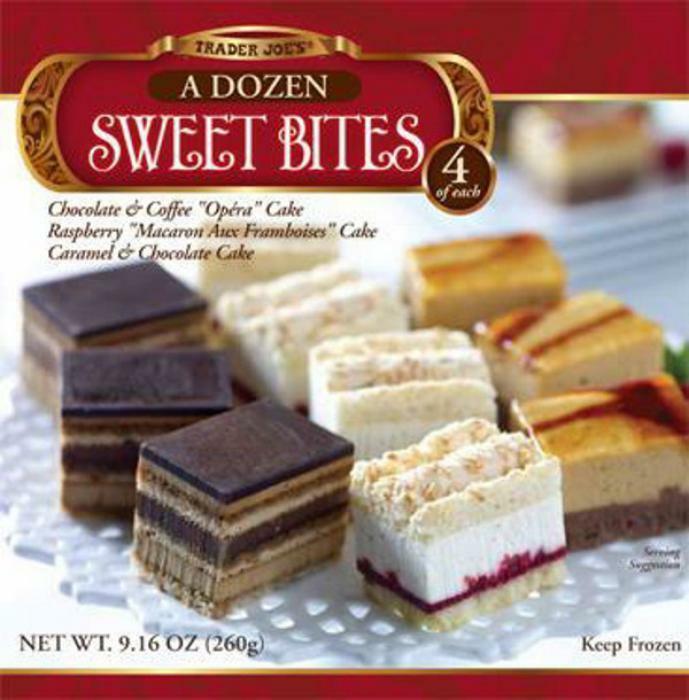 Prolainat is recalling all lots of 9.16-oz packages of Trader Joe’s “A Dozen Sweet Bites” (Chocolate & Coffee Opera Cake, Raspberry Macaron Aux Framboises Cake, Caramel & Chocolate Cake). The product contains coconut, an allergen not listed on the label, but is safe for consumption by those who do not have coconut allergies. No allergic reactions or illnesses have been reported to date. The recalled product was produced from January 1, 2011 to February 5, 2015 and distributed to Trader Joe’s stores nationwide. It was sold frozen and packaged in a 9.16-oz box with a photograph of the product on the front of the box and a UPC #00967679 that can be found printed the back of the package. Customers who purchased the recalled product should discard it or return it to any Trader Joe’s for a full refund. Consumers with questions may contact Trader Joe’s customer relations at 626-599-3817 Monday through Friday, 6:00AM to 6:00 PM, PST. The product may contain raw cashews, an allergen not listed on the label. The recalled product was distributed at three local retail stores in the Cleveland, Ohio area between 12/1/2014 and 3/30/2015. 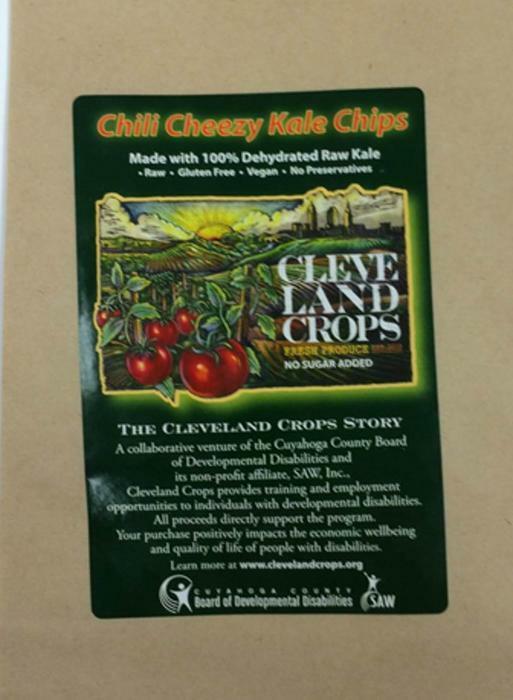 The product is packaged in a 2-ounce, stand-up, paper pouch with a clear viewing window on the back under the “Cleveland Crops” brand, with the UPC code 58736 00504. Consumers who purchased the recalled product may return it to the place of purchase for a full refund and/or contact Solutions At Work, Inc. (dba Cleveland Crops) at (216) 736-4567 Monday through Friday between 8:00 a.m. and 4:30 p.m.
Smith’s Food and Drug Stores is recalling select Smith’s Bakery Fresh Carrot Cake. Customers who are allergic to walnuts should return the product to stores for a full refund. There is no safety issue with the product for consumers who are not allergic to walnuts. No customer illnesses have been reported to date. Consumers with questions about this recall may contact Smith’s customer connect toll-free at 800-576-4377. Mercedes-Benz USA is recalling 5,058 model year 2014-2015 Smart Fortwo Coupes and Convertibles, and 2014 Fortwo Coupe Electric and Fortwo Convertible Electric vehicles. The recalled vehicles have steering gear mounting bolts that may break during vehicle operation. That could affect vehicle handling, increasing the risk of a crash. MBUSA will notify owners, and dealers will replace the steering gear mounting bolts, free of charge. The manufacturer has not yet provided a notification schedule. 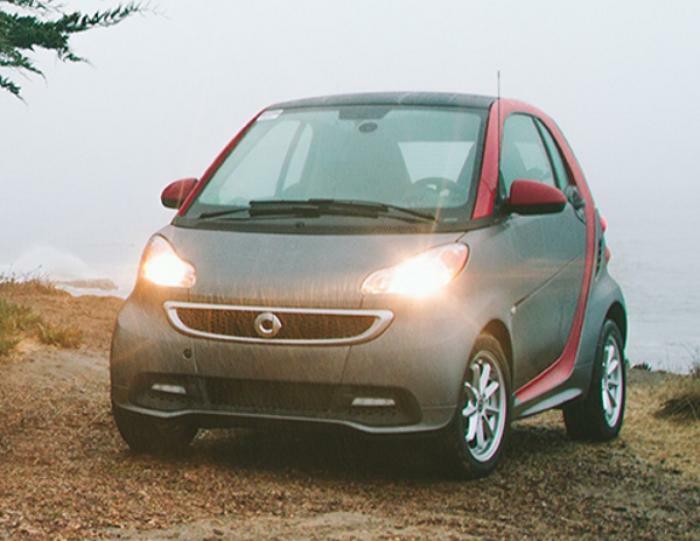 Owners may contact Smart customer service at 1-800-762-7887. Gena Accessories of New York, N.Y., is recalling about 9,400 women's silk scarves. The scarves fail to meet the federal flammability standard for wearing apparel and pose a burn hazard to consumers. This recall involves Gena Accessories women’s silk scarves. The recalled scarves measure 64 inches long by 18 inches wide and were sold in the colors black, brown, burgundy, camel, fuchsia, green, grey, lavender, light blue, light green, light pink, orange, red, turquoise, white and yellow. The scarves, manufactured in China, were sold at specialty accessory boutiques in New York City and online at Amazon.com, GenaAccessories.com and Scarfand.com from January 2007, through February 2015, for about $12. 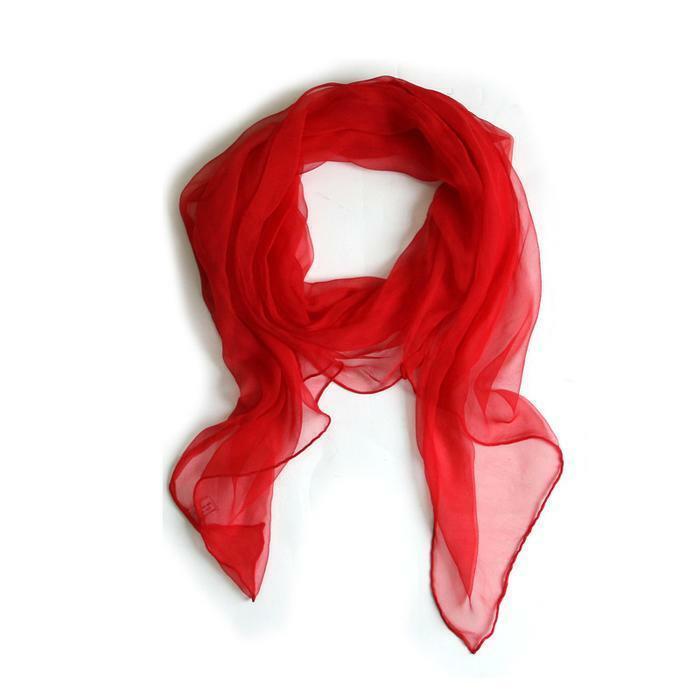 Consumers should immediately stop using the recalled scarves and contact Gena Accessories Inc. for a full refund. Consumers may contact Gena Accessories toll-free at (866) 974-4362 from 9 a.m. to 6 p.m. ET Monday through Friday or by email at info@genaaccessories.com. 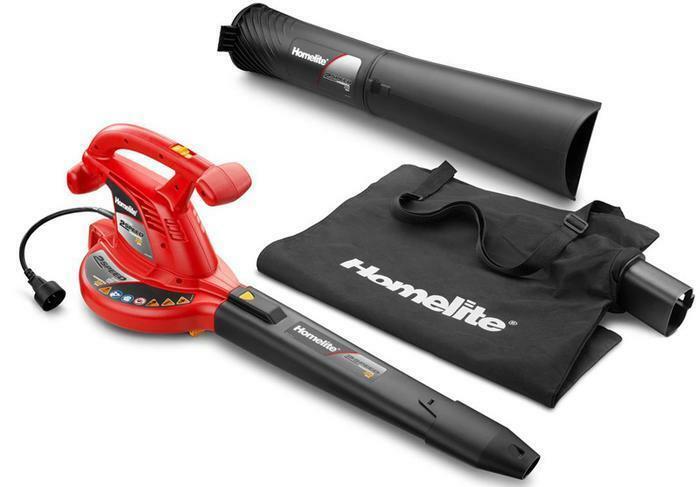 Homelite Consumer Products of Anderson, S.C., is recalling about 864,000 Homelite electric blower vacuums. The blower vacuum can overheat, spark and catch fire, posing fire and burn hazards. The company has received 1,369 reports of blower vacuums sparking, arcing, smoking or burning, including 1 report of minor injury. Models UT42120 and UT42120A of this product were recalled in February 2013. The blower vacuums, manufactured in China, were sold at Home Depot and Direct Tools Factory Outlets stores nationwide and online at www.homedepot.com from January 2010, through March 2015, for about $40. Consumers should immediately stop using the recalled blower vacuums and return them to any Home Depot or Direct Tools Factory Outlet store for a full refund. Consumers may contact Homelite Consumer Products at (800) 597-9624 from 8 a.m. to 5 p.m. ET Monday through Friday. Goochie Goo Garbs of Scottsdale, Ariz., is recalling about 125 Sensory Grab Garb blankets. Wire-edged ribbon used in the blanket’s ribbon tags can become exposed, posing a laceration hazard to children. The firm has received 1 report of a child that was scratched by the wire that came out of the ribbon tag. The Sensory Grab Garb blanket is a 6-inch square of soft fabric with crinkle paper inside and ribbon tags in the middle of each of the four sides. One side of the blanket contains a white satin ribbon tag with the words “Goochie Goo Garbs” on it. The polka-dot ribbon tags are black, blue, green, pink or red ribbons with white polka-dots. The blankets come in a variety of child themed patterns including shapes, animals and superhero themes. 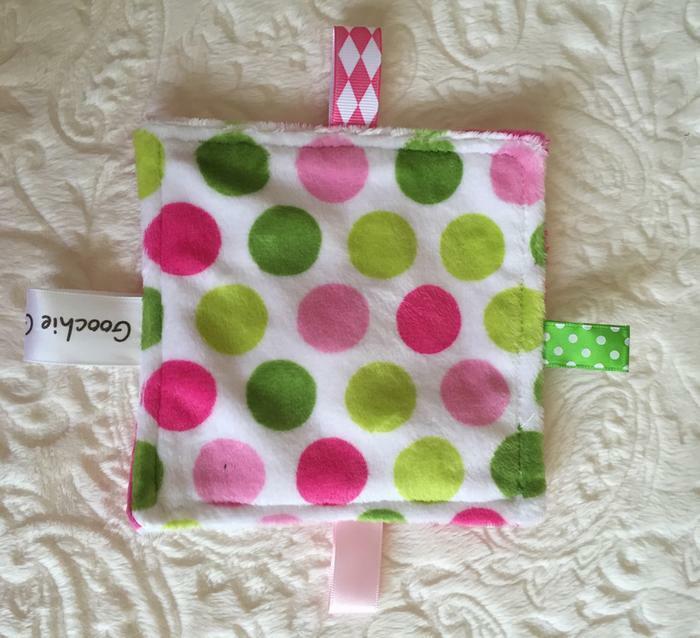 Only the 6-inch square Sensory Grab Garb blankets with colored polka-dot ribbon tags attached to the side of the blanket are included in the recall. The blankets, manufactured in the U.S., were sold at various children’s specialty stores in Arizona, Arkansas, California, Colorado, Kansas, Oklahoma, Texas and Pennsylvania from July 2014, through March 2015, for about $10. Consumers may contact Goochie Goo Garbs collect at (480) 773-1808 from 10 a.m. to 4 p.m. MT Monday through Friday, or by email at customercare@goochiegoo.com. OWT Industries of Pickens, S.C., is recalling about 225,000Expert Gardener electric blower vacuums. The blower vacuum can overheat, spark and catch fire posing fire and burn hazards. The companyhas received 16 reports of blower vacuums sparking, arcing, smoking or burning. No injuries have been reported. This recall involves Expert Gardener 12 amp electric blower vacuums with model numbers 20254EG, 20254EGA, 20254EGB, 20254EGBC, 20254EGC and 21254EG. Model numbers are located on a label on the left side of the motor housing. The blower vacuums are green and black. “Expert Gardener” and “Blower Vac 2 Speed Quiet 150 MPH Powerful 220 MPH” are printed on the side of the green motor housing and on the black plastic blower tube. Models 20254EG and 20254EGC of this product were recalled in February 2013. The blower vacuums, manufactured in China, were sold exclusively atWalmart stores nationwide and online at www.walmart.com from January 2012, through March 2015, for about $40. Consumers should immediately stop using the recalled blower vacuums and return them to any Walmart store for a full refund. Consumers may contact OWT Industries at (800) 597-9624 from 8 a.m. to 5 p.m. ET Monday through Friday. 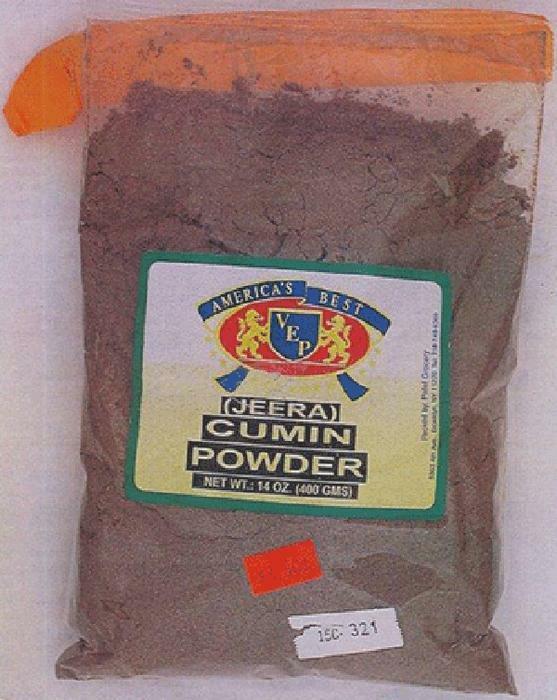 America’s Best brand (Jeera) Cumin Powder is being recalled. The product contains peanuts, an allergen not listed on the label. 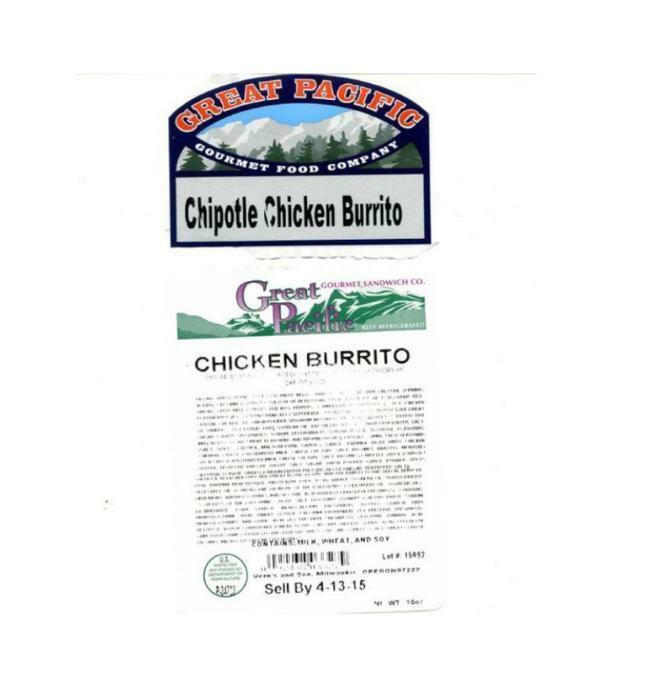 The recalled product was packaged and distributed by Patel Grocery of Brooklyn, N.Y., in an uncoded, 14-oz (400 gm) plastic bag, and sold at various retail stores in Brooklyn. Customers who purchased this product may return it to the place of purchase. Consumers with questions about the recalled product may contact Ishwer Patel of Patel Grocery at (718) 748-6369. Beech-Nut Nutrition of Amsterdam, N.Y., is recalling approximately 1,920 pounds of baby food products. The products may be contaminated with small pieces of glass. The company has received 1 report of an oral injury associated with consumption of these products. The recalled product bears the establishment number “P-68A” inside the USDA mark of inspection, expires in “DEC 2016” and includes product numbers “12395750815” through “12395750821.” It was shipped to retail locations nationwide. Consumers with questions about the recall may contact the Beech-Nut Consumer Hotline at (866) 674-4446. 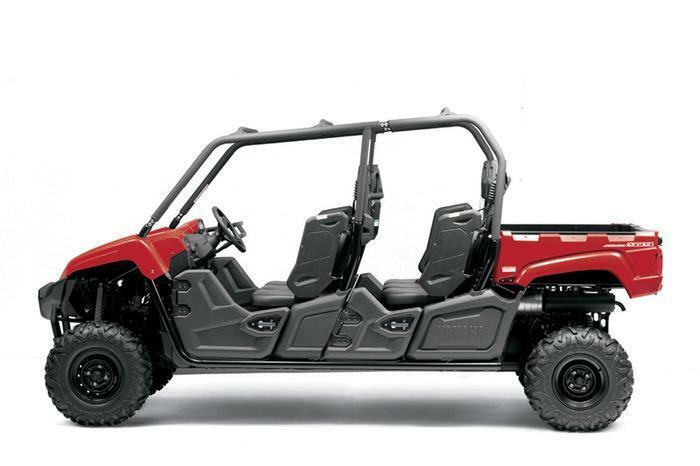 Yamaha Motor Corporation of Cypress, Calif., is recalling about 4,800 Yamaha Viking VI side x side vehicles. The rear wheels can loosen and cause the rear end of the vehicle to wobble or the rear wheels to come off and cause the vehicle to crash, resulting an injury or death hazard. This recall involves 2015 model YXC700DF (Viking VI), YXC700DHFH (Viking VI Hunter), YXC700PF (Viking VI EPS) and YXC700PHFH (Viking VI EPS Hunter) side x side vehicles. Model numbers can be found on the owner’s manual. The letter F in the 10th position of the Vehicle Identification Number (VIN) indicates that the vehicle is 2015 model. The VIN is stamped on the frame behind the left rear wheel. The “Viking VI” model name is printed on the left side of the front hood. The vehicles come in Realtree (multicolor), hunter green, red and steel blue. The recalled vehicles, manufactured in the U.S., were sold exclusively at Yamaha side x side dealerships nationwide from June 2014, through March 2015, for $12,800 to $14,600. Consumers should immediately stop using the vehicles and contact their local Yamaha dealer to schedule a free repair. Yamaha is contacting all registered owners directly. 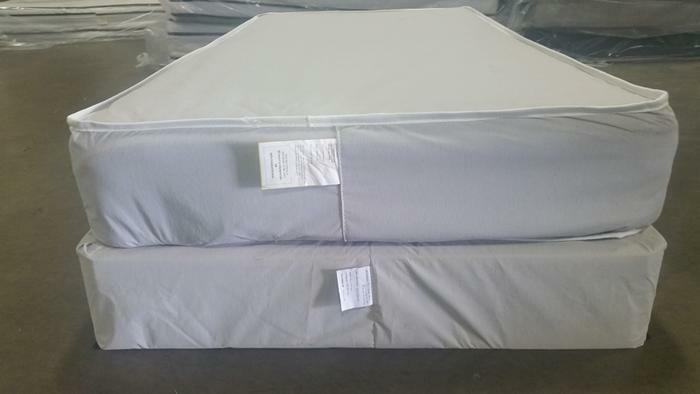 San Pedro Manufacturing Company of Atlanta, Ga., is recalling about 4,800 mattresses and mattresses with foundations. The products fail to meet the mandatory federal open flame standard, posing a fire hazard. The rebuilt mattresses and mattresses with foundations come in twin, full, queen and king sizes. They come in a variety of fabrics and colors, and have a white federal tag and yellow state tag with “San Pedro Manufacturing Company, 1041 La Grange Blvd, Atlanta, Georgia 30336” sewn at the foot of the mattress. All mattresses sold separately, and all mattress and foundation sets are being recalled. The recalled products, manufactured in the U.S., were sold at A1 Mattress and Furniture, Affordable Furniture, Beds Beds Beds, Bruce Furniture and Thrift, Checkouts, Christian Outreach, Fowlers Furniture, Greenbrier Furniture, Larry Rhodes, Mattress and Furniture Outlet, Mattress and Furniture Warehouse, Mattress Barn, Save Big Mattress and Unclaimed Freight from May 2013, through January 2014, for between $80 and $400. Consumers may contact San Pedro Manufacturing Company toll free at (855) 997-0300 from 10 a.m. to 4 p.m. ET Monday through Friday. 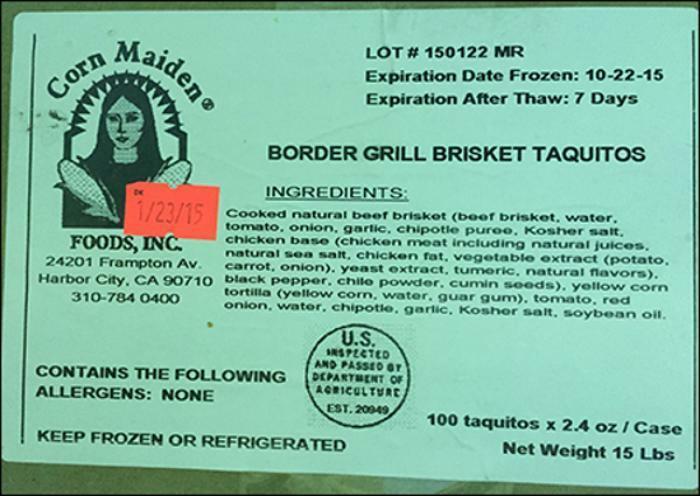 Corn Maiden Foods of Harbor City, Calif., is recalling approximately 15,600 pounds of pork tamales, pork Yucatan, and beef brisket taquitos products. The products contain hydrolyzed soy protein, an allergen not listed on the label. The recalled products bear the establishment number “EST. 20949” inside the USDA mark of inspection, and were shipped to hotels, restaurants and institutional locations in California. Consumers with questions about the recall may contact Pascal Dropsy at (310) 784-0400 ext. 221. 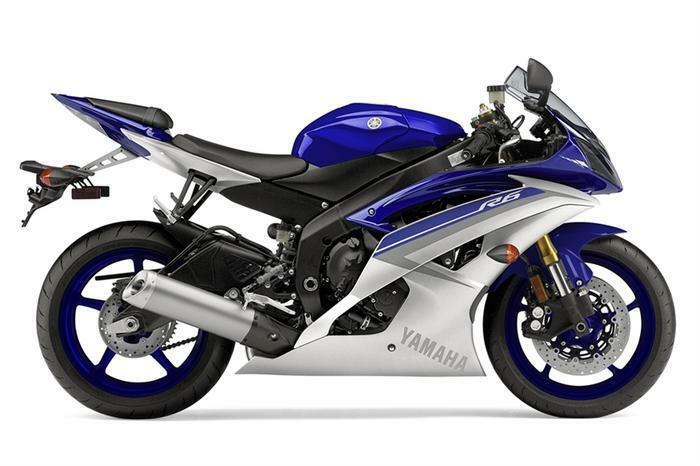 Yamaha Motor Corporation, USA is recalling 4,900 model year 2015 FJ-09 (FJ09F/FC), FZ-09 (FZ09F/FC), FZ6R (FZ6RF/FC), Super Tenere (XTZ12F/FC), Super Tenere ES (XTZ12EF/EFC), and R6 (YZF-R6) motorcycles manufactured September 1, 2014, to November 17, 2014. The recalled motorcycles may have an incorrectly manufactured shift cam segment stopper, having a sharp edge on the inside of the bend instead of a smooth radius. As a result, the stopper can crack and possibly fracture at this sharp edge. If the stopper fractures, the transmission may not shift properly, increasing the risk of a crash. Yamaha will notify owners, and dealers will replace the shift shaft assembly with a new one, free of charge. The recall is expected to begin in April 2015. Vern’s and Sons Food Service of Milwaukie, Ore., is recalling approximately 450 pounds of beef and chicken products. The products were produced without federal inspection and outside inspection hours. The recalled products bear the establishment number “P-34723” or “Est. 34723” inside the USDA mark of inspection, and were shipped to retail locations in Oregon and Washington. Consumers with questions may contact Chris Thomas, at 1-800-658-3993. 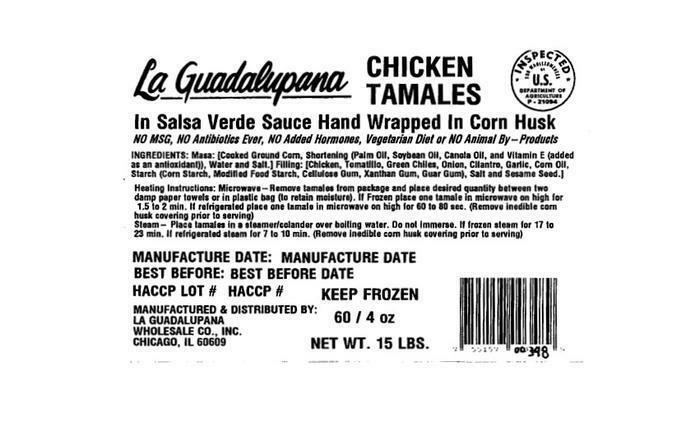 La Guadalupana Wholesale of Chicago, Ill., is recalling approximately 34,923 pounds of pork and chicken tamale products. The products contain egg whites, an allergen not listed on the label. The recalled products bear the establishment number “EST. 21094” or “P-21094” inside the USDA mark of inspection, and were shipped to retail locations in Illinois, Indiana and Wisconsin. The problem was discovered by FSIS in-plant personnel during routine verification activities. Consumers with questions about the recall may contact Alejandro Castro at (866) 954-3654 or by email at info@senortamale.com. Smooth Industries of Oceanside, Calif., is recalling about 7,600 sets of children’s pajamas. The garments fail to meet federal flammability standards for children’s sleepwear, posing a risk of burn injuries to children. 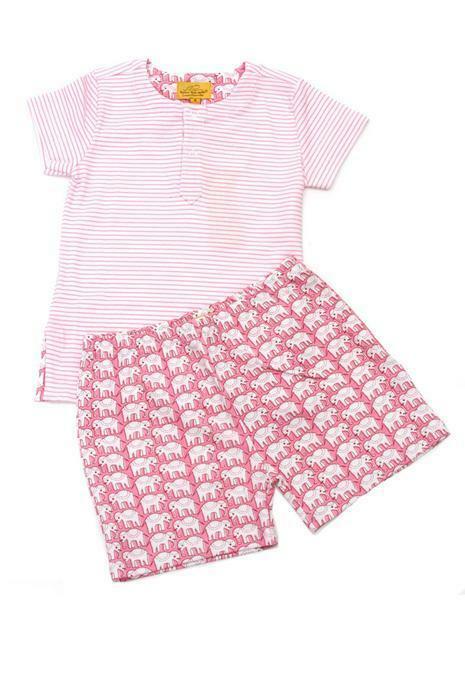 This recall involves children’s one- and two-piece Smooth Industries pajama sets. The pajamas are made of 100% polyester and were sold in four styles: Ride Smooth, Honda, MX Superstars and Moto X. The racing-themed pajamas have large motocross-related graphics and were sold in red, white and black; orange, white and black; and red, blue and black. One-piece pajama sets were sold in sizes: 6 to 12 months, 12 to 18 months and 18 to 24 months. Two-piece sets were sold in sizes XS to Youth XL. “Smooth Ind.” and “smoothindustries.com” is printed on the garment’s neck label. 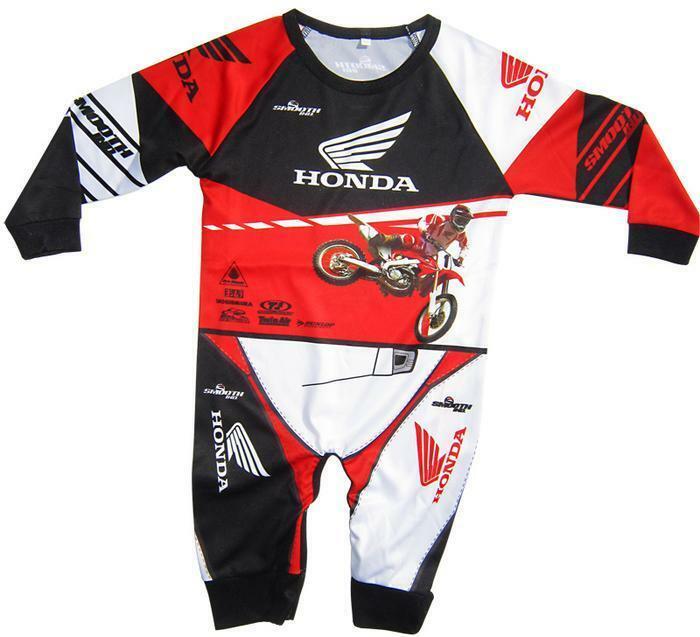 The pajamas, manufactured in China, were sold at authorized Smooth Industries motorcycle and motocross stores nationwide and online at SmoothIndustries.com and other motocross websites from October 2012, through January 2015, for between $30 and $35. Consumers may contact Smooth Industries toll-free at (844) 216-2076 from 9 a.m. to 5 p.m. PT Tuesday through Friday. Best Foods of Edison, N.J., is recalling its 7-oz. and 14-oz. 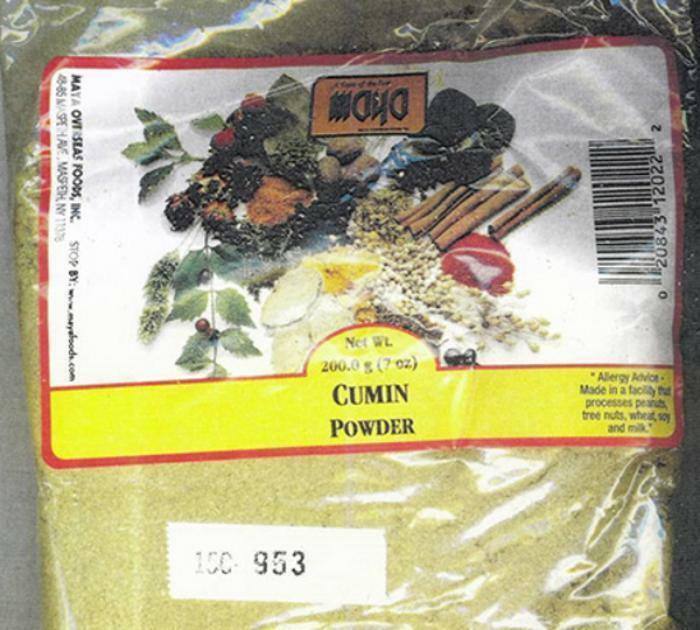 packages of Deer brand Cumin Powder. The product may contain peanuts, an allergen not listed on the label. Some of the 7-oz. packages are marked with UPC number 714760027497, and some of the 14-oz. packages are marked with UPC number 714760027503. The recalled clear and yellow plastic packages were sold at retail stores in New York, Connecticut, New Jersey, Massachusetts, Pennsylvania, Delaware and Virginia. Consumers who purchased the recalled product should return it to the place of purchase for full refund. Consumers with questions may contact the company at 1-732-650-1300 Ext 222, Monday – Friday 9 a.m. – 5 p.m. EST. This recall order is due the pharmacy’s inability to ensure sterility, stability, and potency for these products. In addition to ordering a recall, the Board of Pharmacy ordered the Prescription Center closed. The Board has not received a complaint of an injury caused by any recalled product, but use of compounded products lacking assurance of sterility, stability, and potency places patients at risk. Prescription Center distributed the recalled compounded products in all fifty (50) states, as well as Canada, between September 10, 2014, and March 10, 2015. Health care providers and patients should stop using all compounded products distributed by Prescription Center immediately and dispose of the products according to state and/or local government guidelines. Questions concerning disposal should be directed to the board of pharmacy in the patient’s or health care provider’s home state. The Food and Drug Administration’s website also provided recommendations on safe disposal. Patients or health care providers with questions regarding this recall may contact the North Carolina Board of Pharmacy at 919.246.1050. Patients who have concerns regarding use or consumption of any recalled products should contact their health care provider. Suspected adverse reactions or quality problems experienced as a result of using recalled product may be reported to the North Carolina Board of Pharmacy and the FDA's MedWatch Adverse Event Reporting program either online, by regular mail or by fax. 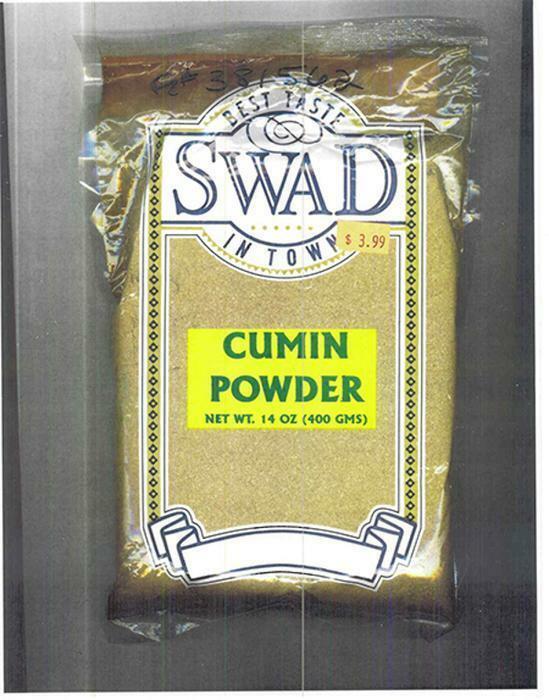 Raja Foods of Maspeth, N.Y., is recalling its 14-oz packages of SWAD Cumin Powder. The recalled product was sold in South Asian retail stores in New York, New Jersey and Connecticut. It comes in a 14-oz, clear packaged marked with batch number 24714 on the back with an expiration date of Sept 2017. Customers who purchased this product should return it to the place of purchase for a full refund. Consumers with questions may contact the company at 718-416-2632. 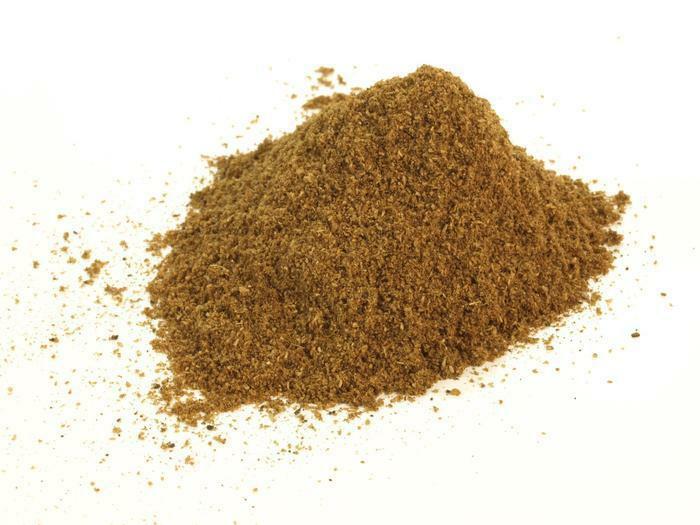 Maya Overseas Food of Maspeth, N.Y,, is recalling its 7-ounce packages of Cumin Powder. The recalled product, which comes in a 7-oz, clear plastic package and is un-coded, was sold in retail stores in New York, Connecticut, New Jersey, Massachusetts, Pennsylvania and Virginia. Consumers who purchased the recalled product should return it to the place of purchase for a full refund. Consumers with questions may contact the company at 718-894-5145. 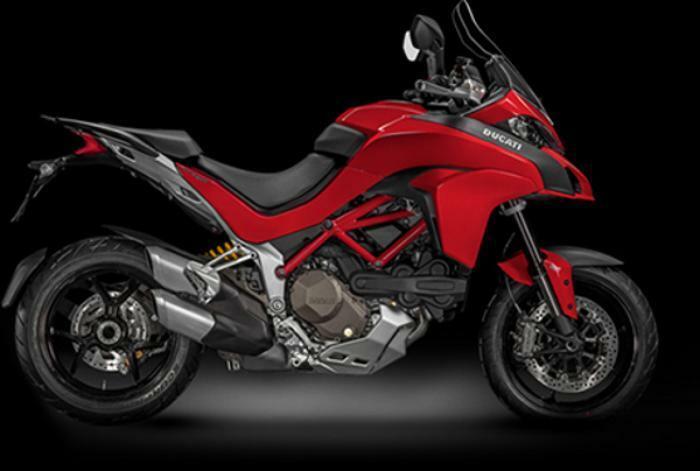 Ducati North America is recalling 5,962 model year 2010-2014 Multistrada 1200 motorcycles. The inner sleeve of the opening throttle cable may move and prevent the full closing of the throttle. If the throttle cannot be fully closed, there is an increased risk of a crash. Ducati will notify owners, and dealers will replace the upper throttle cover with one that prevents the inner throttle sleeve from moving, free of charge. The recall is expected to begin May 11, 2015. Owners may contact Ducati customer service at 1-800-231-6696. Ducati's number for this recall is RCL-15-001. 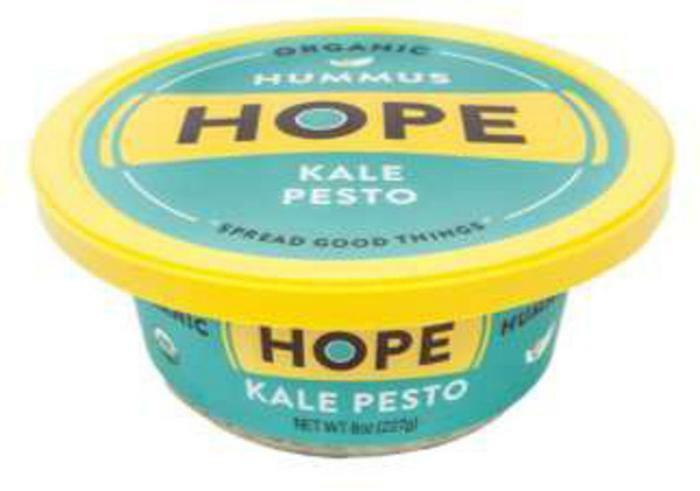 Hope Foods is recalling one specific lot of Kale Pesto Hummus. The product contains walnuts, an allergen not listed on the label, but is safe for consumption by those who do not have walnut allergies. The recalled product was distributed in 8-oz plastic tubs and is marked with a Best By date of 05/04/15 and Lot Code of 030215-KP which can be found on the side of the lid. The unit UPC is 8-56500-00426-6. The company says it believes fewer than 3100 units have been distributed nationwide to limited retailers and wholesalers in the US only. Consumers with a walnut allergy who purchased the affected product should dispose of it or return it to the store where it was purchased for an exchange or full refund. Consumers with questions may call Hope Foods at 720-663-7123, Monday through Friday 9:00 am to 5:00 pm MST. Giant Eagle is recalling select Giant Eagle brand Danish pastries, Bolillo rolls, specialty cheese, meringue pies and heat & serve fried fish, prepared and sold from the Bakery, Cheese and Prepared Foods departments inside Giant Eagle and Market District stores. The products contain eggs and milk, allergens not listed on the labels, but are safe for consumption by those who do not have egg or milk allergies. There are no confirmed illnesses to date associated with these recalls. 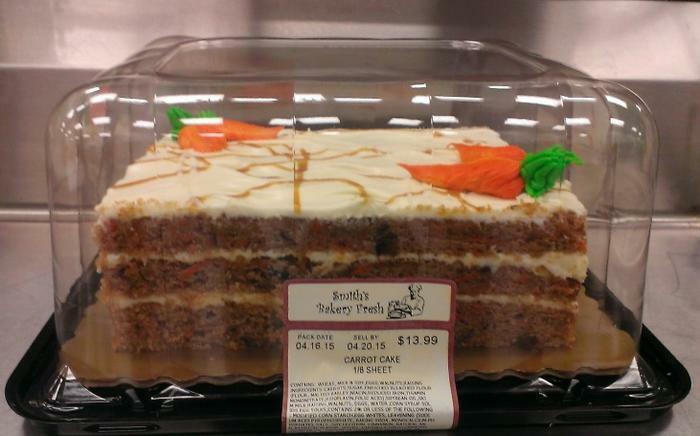 59779 10298 Through March 28, 2015 Giant Eagle and Market District Pa., Ohio, W.Va. and Md. 27754 60299 Through March 28, 2015 Giant Eagle and Market District Pa., Ohio and Md. 09971 30799 Through March 31, 2015 Giant Eagle and Market District Pa., Ohio and Md. Heat & Serve Fried Fish 37156 00000 Through April 3, 2015 Giant Eagle and Market District Pa., Ohio and Md. Customers with egg or milk allergies who purchased the recalled products should dispose of them or return them to their local Giant Eagle and Market District store for a refund. Consumers with questions may call Giant Eagle customer care at 1-800-553-2324 Monday through Friday 9 a.m. to 9 p.m. EDT. 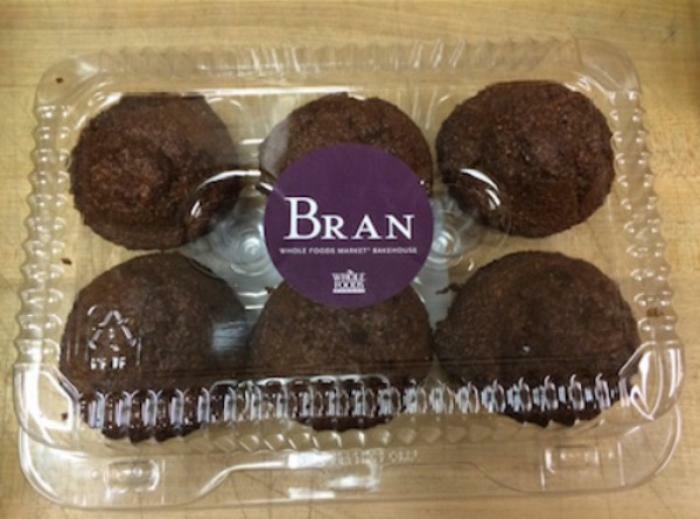 Whole Foods Market is recalling bran muffin six packs produced and sold in retail stores in the southwest region, which includes Texas, Oklahoma, Louisiana and Arkansas. The product contains eggs and milk, allergens not listed on the label. The product was sold in six packs packaged in clear plastic containers, PLU 24857800499 with best by dates of 1/21/15 to 4/6/15. Consumers who purchased the recalled product should discard it and bring their receipt to the store for a full refund. Consumers with questions should contact their local store between hours 9am and 5pm CST any day of the week. 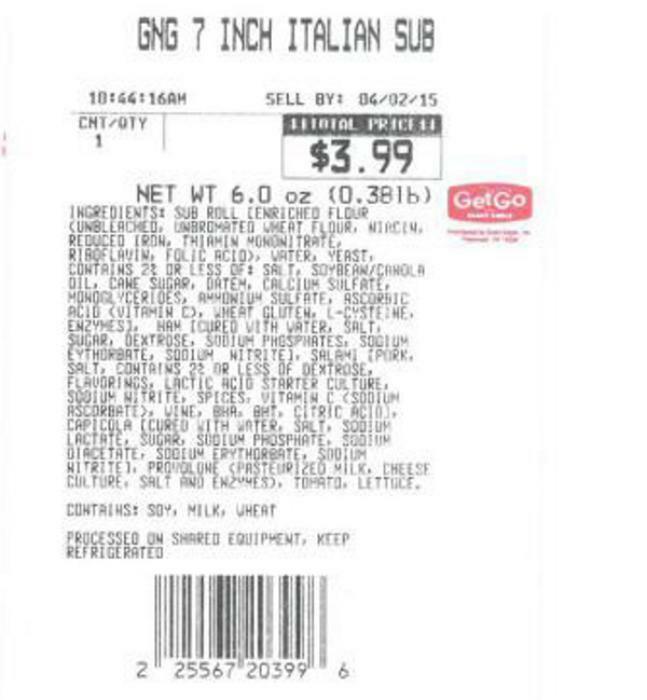 GetGo from Giant Eagle is recalling individually wrapped Grab-and-Go subs, sold from Grab-and-Go/”Fresh-to-Go” display cases inside GetGo locations. The product contains eggs, an allergen not listed on the label, but are safe for consumption by those who do not have an egg allergy. There are no reported illnesses to date associated with this recall. 25567 20399 Through April 2, 2015 GetGo Pa., Ohio, W.Va. and Md. Customers with an egg allergy who purchased the recalled product should dispose of it or return it to their local GetGo location for a refund. Blinds To Go of Lakewood, N.J., is recalling about 200,00 custom-made window shades. The shade’s chain or cord loop can slip out of the hold-down device, posing a strangulation hazard for small children. The recalled custom-made shades have a hold-down device for the cord that is a clear, P-shaped plastic hook. 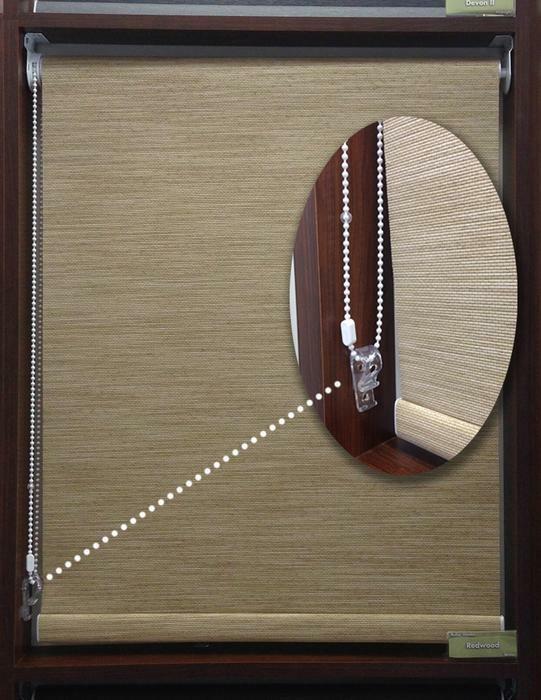 The cord or chain loop of the window shades clips into the device. The hook is screwed to the side of the wall or window during installation. It was shipped with the Blinds To Go custom-made roller shades with Sidewinders; Smartlift pleated and cellular shades; Panel Tracks shades and Serenity shades. The shades, manufactured in the U.S., were sold exclusively at Blinds To Go showrooms and online at www.blindstogo.com from January 2009, to November 2014, for between $60 and $770. Consumers can contact the company to order a free retrofit kit that includes a new hold down device and instructions on how to replace the recalled part. They also can bring the window shades to a local showroom to have the new device fitted on the shades. Consumers may contact Blinds To Go customer service at (800) 254-6377 from 9:30 a.m. to 9 p.m. ET Monday through Saturday and 12 p.m. to 5 p.m. ET on Sunday. 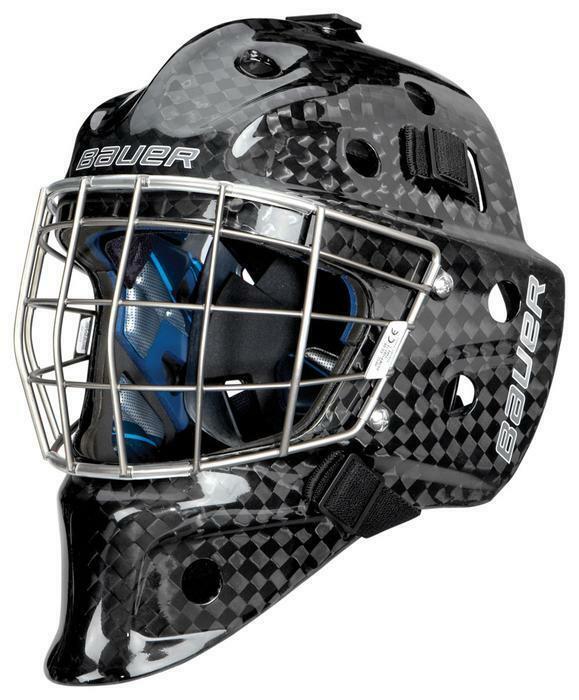 Bauer Hockey of Exeter, N.H., is recalling about 2,500 goalie masks and replacement wire cages. The company has received 9 reports of wire breakage -- 1 in the U.S. and 8 in Canada. Lacerations were reported in 3 of the Canadian incidents and the 1 U.S. incident. This recall involves cages on the Concept C1 Goal Mask with Certified Titanium Oval Wire and the NME 10 Goal Mask with Certified Titanium Oval Wire, and the RP NME Ti Titanium Replacement Cage. The Concept C1 and NME 10 goalie masks were sold in black or white with a titanium wire cage that attaches to the mask with two screws on each side of the mask. The Concept C1 mask is a Senior mask in sizes S/M and M/L. “Concept C1” is printed at the top of the shell. A sticker inside the shell at the jaw also lists the model and size. The NME 10 Goal Mask is a Senior mask in sizes Fit 1, Fit 2, and Fit 3. “NME10” is printed at the top of the shell. A sticker inside the shell at the jaw also lists the model and size. The recalled equipment, manufactured in Thailand, was sold at independent sporting goods and online retailers nationwide from April 2013, through February 2015, for about $900 for masks with cages and $90 for replacement cages. Consumers may contact Bauer Hockey toll-free at (844) 448-4246 from 8:30 a.m. to 4:30 p.m. ET Monday through Friday.